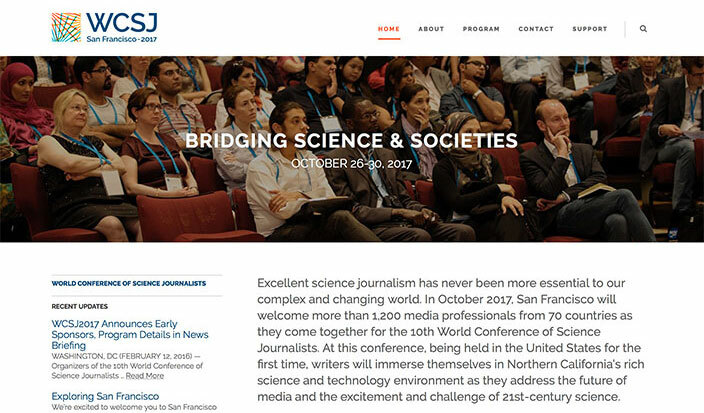 PROJECT: In October 2017, San Francisco will welcome more than 1,200 media professionals from 70 countries as they come together for the 10th World Conference of Science Journalists. A conference of this magniture requires a proper print and web presentation. Todd Schulte, an excellent designer with whom I frequently collaborate, took care of the design while I executed a clean modern WordPress site to compliment his work. A key requirement was that the maintenance of the site be easy enough for the staff at WCSJ to maintain it themselves moving forward. This included a multi-hour training course for the staff upon completion of the site.